Health Hazards - the most significant health hazards in the mining industry include airborne contaminants such as coal dust, silica dust, diesel particulates and excessive exposure to noise levels. 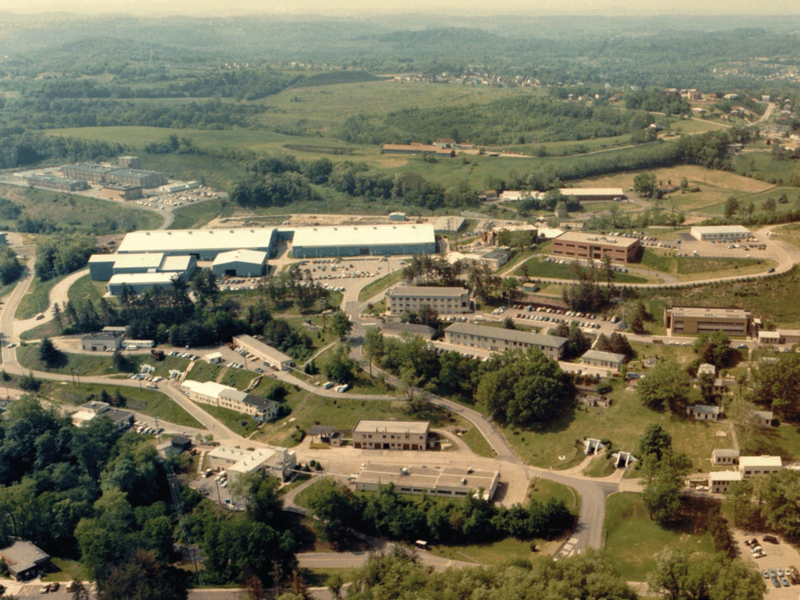 Pittsburgh research teams study the development of control technologies and strategies for airborne contaminants including improved measurement systems, laboratory and field studies to design, assess and demonstrate airborne hazard reduction systems. Similar work is ongoing regarding noise-induced hearing loss in mineworkers. Safety Hazards - while the safety record of the mining industry has improved dramatically, this occupation remains one of the more hazardous due to the nature of the work environment. Poor visibility, restricted workspaces, large machinery, significant material handling tasks and unstable ground all contribute to the hazards found in mining operations. Pittsburgh supports multi-disciplinary research to provide the technical and scientific basis for improvements in conditions, work systems and technologies. Disaster Prevention - due to the unique nature of underground mining operations, the potential exists for explosive gas releases, mine fires and massive roof failures. Research is ongoing to improve the understanding of the basic phenomena of mine explosions, designing explosion and fire suppression strategies, and developing approaches for minimizing or preventing massive rock failures. Researcher conduct experiments in unique laboratories such as the Mine Roof Simulator, as well as field studies in operating mines. Catastrophic Failure Detection and Prevention - this program is organized to detect and prevent catastrophic failure (collapse of mine roofs, rock bursts, slope failures, etc.) in mines through laboratory and field investigations. The research utilizes the latest in computer modeling techniques to visualize and simulate mine conditions to test the risks of using alternative mining methods and support technologies. Mining Injury and Disease Prevention - this program identifies and classifies risk factors in mining and evaluates recommendations for strategies to prevent injuries and disease through the use of effective control technologies. Researchers study the design of mining equipment to assess the potential risks involved in using it; and design, build, and test equipment that incorporates innovative control technologies. Mining Surveillance and Statistical Support - researchers track trends in mining injuries, fatalities, and disease and conducts hazard surveillance concerning the use of new technologies in the mining industry. The Safety Structures Testing Laboratory is dedicated to large-scale material and structural testing relating to the prevention of roof and rib falls. 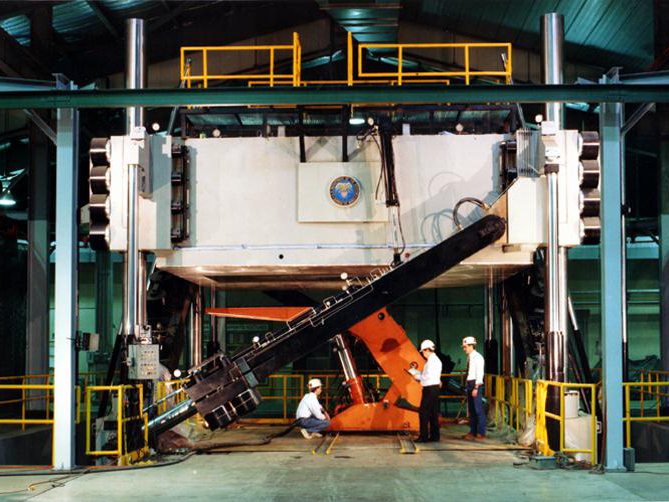 The focal point of the SST laboratory is the Mine Roof Simulator (MRS) biaxial load frame that simulates the extreme weight and movement of the supported overburden rock when extracting coal or other minerals from the earth. The MRS can accommodate specimens up to 16 feet high, 20 feet wide and 20 feet long. The MRS achieves precision load testing by closed-loop, servo controlled actuators with six degrees of freedom control of the lower platen. The MRS can apply up to 3 million pounds of vertical force through the 24-inch stroke of the lower platen and, simultaneously, up to 1.6 million pounds of horizontal force through lateral displacement of the lower platen through a 16-inch stroke. The MRS is the largest load frame of its kind in the world and is the only load frame that can simulate the complex behavior of rock masses at great depths below the surface. Testing core samples on the direct shear test frame. The Soil/Rock Properties Laboratory is contained in the soils bay, a 4,700 sq. 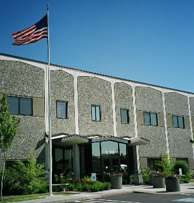 ft. facility that provides space and equipment for preparing, characterizing, and testing consolidated and unconsolidated materials. 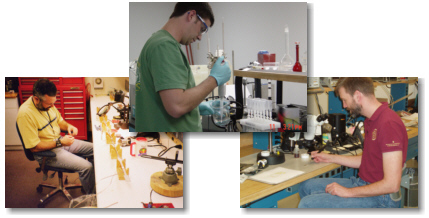 The laboratory provides the capability to wash, screen, dry, and mix unconsolidated materials such as soils prior to testing. 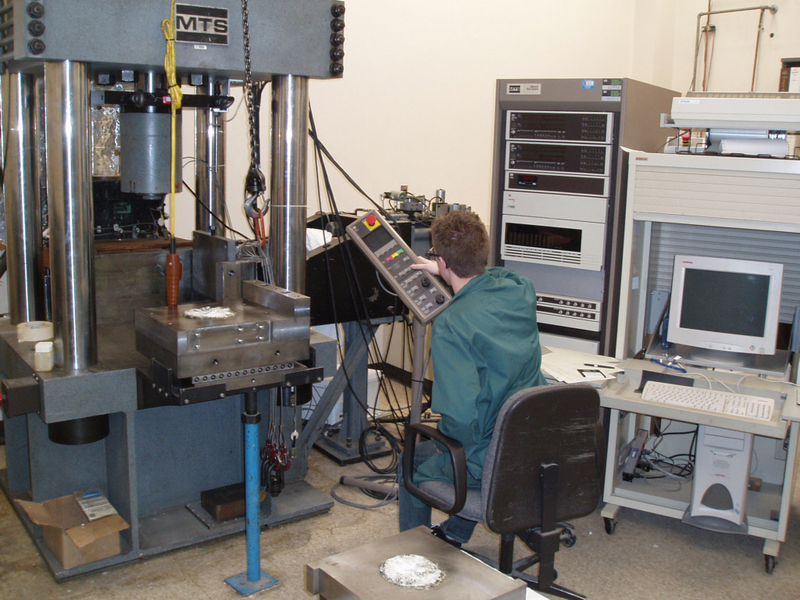 Researchers test consolidated or cemented materials and rock for various engineering properties using a suite of test frames in the laboratory. The laboratory contains a 70 sq. ft. wet cure room equipped to fog-cure cementitious samples prior to testing. Depending on the samples' components or the required curing timeframe, the room provides space for large-sized samples as well as a large number of samples. The laboratory is also equipped with a million pound compression test frame, programmable controlled tension-compression test frame, three tension-compression test frames, and a fiber-panel testing device. 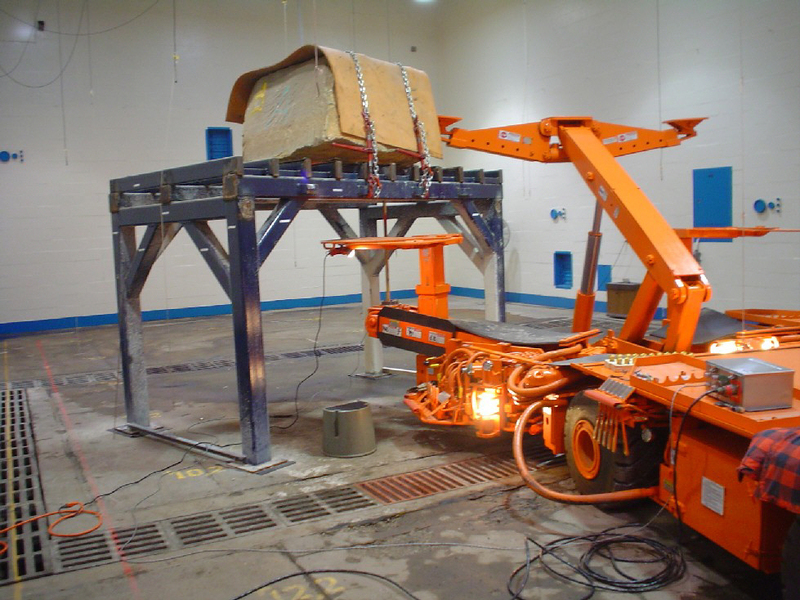 The labs large scale direct shear test frame (300,000 pound axial and shear forces) with programmable control is used for biaxial testing on rock, concrete, and soil samples. The sample size can vary from 1 inch diameter rock cores to 14 inch square concrete blocks. Safety research coal mine portal. The Safety Research Coal Mine and Experimental Mine complex is a multi-purpose underground mine facility used to support research for the development and evaluation of new health and safety interventions for mineworkers. Researchers have utilized its 4 miles of underground workings extensively since the pioneer stages of mine health and safety research. The Experimental Coal Mine consists of two drift entries driven into the Pittsburgh coal seam developed to support full-scale mine explosion tests. 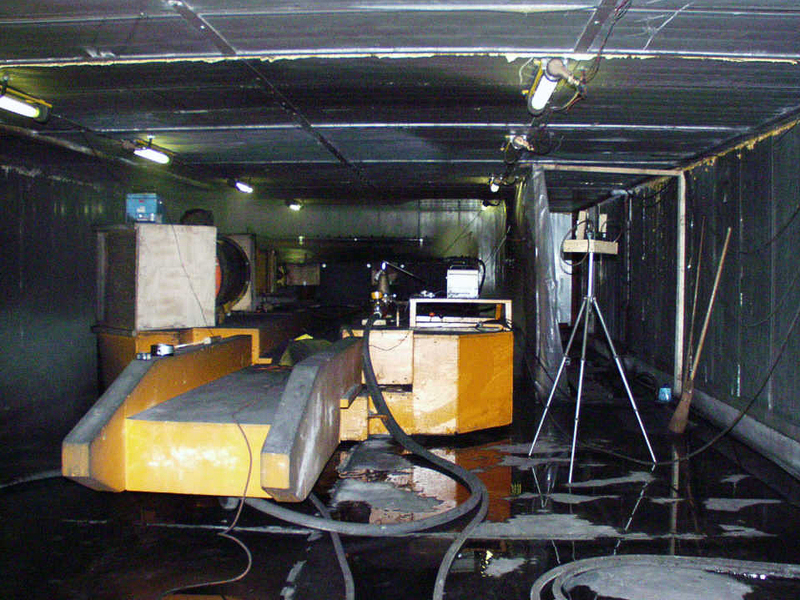 The Safety Research Coal Mine is a room-and-pillar operation approximately the size of a working section and is utilized for research in areas such as ground control, ventilation, fires, explosives use, materials handling, and environmental monitoring. A full-time staff of miners provides technical and physical assistance to in-house and contract researchers. Sound power measurements on a Fletcher HDDR roof bolter in the acoustic test chamber. The NIOSH Acoustic Test Chamber is a very large acoustic reverberation chamber. It is mainly used to assess experimental noise controls on machines by measuring total sound power before and after the controls are installed. Determining sound power level in a reverberant field is one of several methods available to calculate the noise emission of equipment. Per ISO acoustics standards for determining sound power in reverberant fields (ISO 3741/ ANSI S12.51 - precision grade measurements or 3743-2 - engineering grade measurements), the device under test should be a small percentage of the volume of the test chamber. This reverberation chamber has a volume of roughly 1,300 cubic meters, four times the size of what is considered a large chamber. Thus, the chamber is ideal for sound power level testing of the large equipment typically found in mining and construction environments. Further, a state of the art data collection, analysis, and reporting system allows for a significant amount of testing in a short period. Currently, NIOSH is NVLAP accredited for sound power level testing per the ISO 3741/ANSI S12.51 standard. 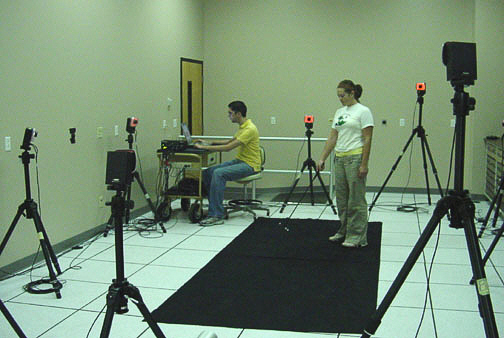 Researchers calibrating the motion analysis system. Data on human movement is useful for simulation modeling (using virtual humans) and for biomechanical studies. Force plates measure forces at the feet which, when combined with motion data from the motion capture system, provide information regarding the loads experienced by the joints of the body during work activities. EMG equipment measures muscle activity, which provides estimates of muscular fatigue and the forces needed to perform a task. This laboratory allows researchers to test under controlled conditions new methods of performing work that minimize physical stresses and injury risk. Mining machine in the Full Scale Continuous Miner Dust Gallery. attribute dust and gas concentration changes to the specific use of one or more control technologies. Within the gallery, researchers can control the face ventilation, water spray parameters, machine mounted dust collector operation, mining height, and mining machine position. Respirable coal mine dust and sulfur hexafloride tracer gas are released between the rotating machine drum and mining face. These airborne contaminates can be measured at multiple locations around the mining machine to study their response to engineering control technologies being tested. Engineering control technologies tested and found to reduce dust and gas levels in the continuous miner dust gallery have a greater chance of success in an underground mine environment. Virtual Immersion and Simulation Laboratory. The Virtual Immersion and Simulation Laboratory (VISLab) uses state-of-the-art 3D display technology to create virtual environments for training mineworkers. Stereoscopic projection systems allow the creation of zero-consequence training environments that simulate mine emergencies that would be impossible to replicate in the real world. By using different interaction devices, researchers capture and analyze data within the training simulations to determine faults or flaws that need further evaluation and discussion. The facility includes a unique, state-of-the-art, 360-degree cylindrical projection system that uses stereoscopic 3D technology to enhance the immersion and experience of the users. It has the capability of putting an entire group into a virtual environment that they can interact with, providing an intuitive training experience that immerses anyone within it. An adjacent 50-degree curved display acts as a classroom environment for instructor driven sessions and as a post-simulation debriefing environment following the sessions run in the 360-degree environment.